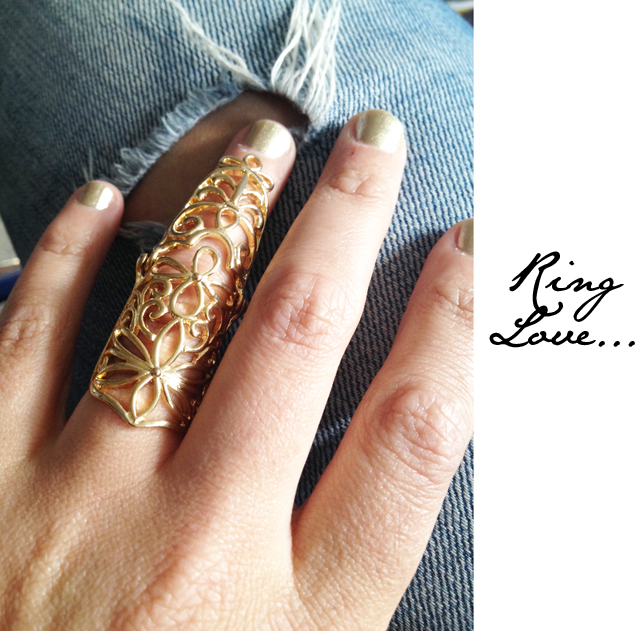 The new gold ring around my finger... the entire finger! So here's the scene. I'm at the Dubai Grazia Style Awards watching Amber Atherton and Giles Deacon present the ceremony to a packed room and I'm totally feeling under-blinged from the get-go. Amber is on stage sporting more gold than a Cartier stock room and I'm wearing what I believe to be some serious arm candy and that's about it. After the last award is handed out and the DJ takes his place on the stage, Amber comes to sit at the table and the first words out of my mouth are... "girl... those rings!" She has on two full finger rings that glitter and shine like the hot hot sun outside. I'm in love. Two seconds later, I find one on my ring finger. Oh, that Atherton knows how to make a girl smile. The rest, as they say, is history. It's been a week since the night the My Flash Trash Filigree Armour Ring found it's new home on my left hand and hardly a moment has passed that we haven't shared together. Thank you gorgeous Amber for the beautiful new addition to the "finger frenzy" (doesn't work as nice as "arm candy" does it? ).